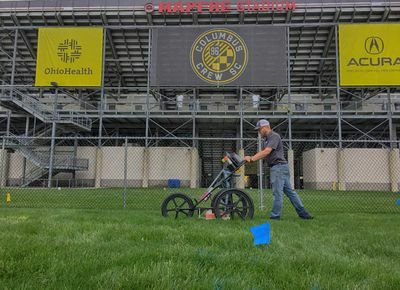 Ground Penetrating Radar Systems was contacted by a facilities manager to conduct a private utility locate at the Columbus Crew SC arena. The facilities manager was planning to install a fence for a concert, however they wanted to have the project area scanned before they got started with their project. The scope of this scan was to locate, and mark out the utility lines in the area so that the required drilling for the fence install could be performed. During the scan, GPRS Project Manager, Mitch Streight scanned the area, and located / mark out all of the utilities lines on the area. Thanks to our quick response time and detailed & accurate work, once the scan was finished, the facilities manager used the results of the scan to move forward with the fence install project, and they were able to perform the required drilling without any issues. GPR technology is an affordable, and effective way to locate near-surface items such as underground utility lines, underground storage tanks, and voids. GPR technology can also be used to scan concrete slabs for rebar, conduits, and other near-surface items. For more information on how GPRS, LLC. can help you on your next project, please contact Project Manager, Mitch Streight by phone at (614) 400-6889 or by email at mitch.streight@gprsinc.com.